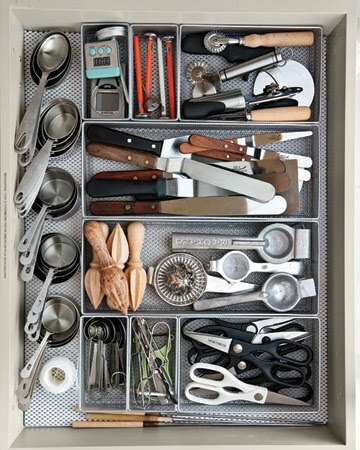 I am craving organization lately, craving it. I am going through a total cleaning phase. 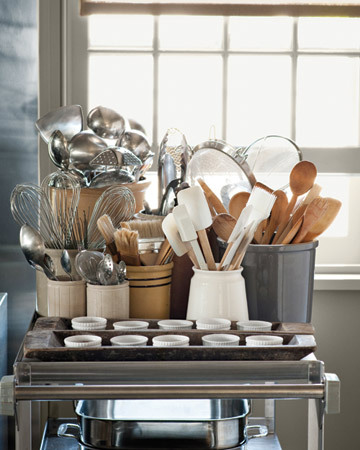 organized, it just makes things easier all the way around. But I am setting my standards high! 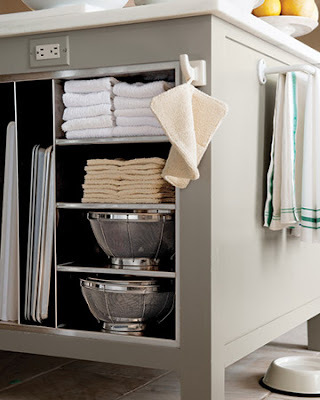 All photos courtesy of Martha Stewart Living. 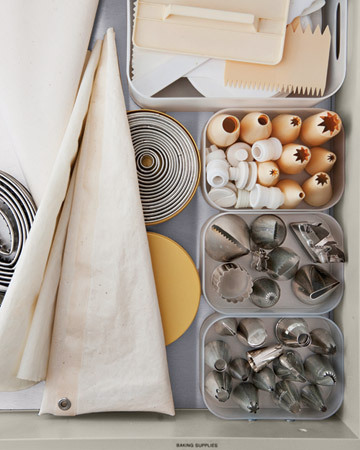 Who knew organization could be so lovely? Life is much easier now that I don't risk get my fingers sliced open everytime I reach for a fork! Great idea! Autumn always makes me take a second look at all I've accumulated over the year. Really with all the cold rainy days it's a great time to clean and organize. happy editing! I thought those were your pictures at first, they are inspiring indeed. Oh Mel I have all the exact same pictures! I saved them after stalking Martha's website and thought how I wished I could be this organized. I thought saving them on my computer would help motivate me. So far it hasn't.... Hope you have an amazing day! Martha is beyond amazing. What I do love about her show/ideas is that, you can take what you want from them and leave the bits which you feel are not quite "live-able" for your home and family. She's a constant teacher too. 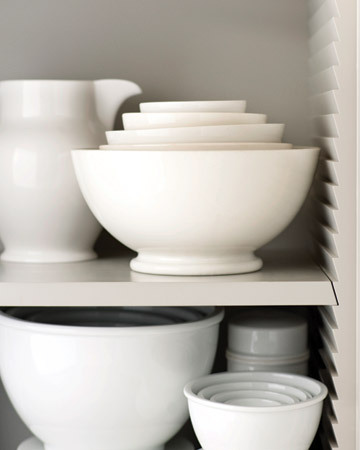 I think Martha was really the one who shared her love of white china, and sageie greens, and vintage mixing bowls. A lot of her ideas filter through many of the blogs today. She's the best. 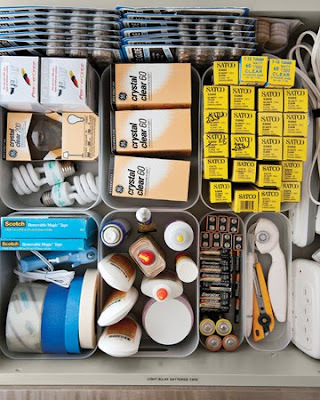 I would absolutely love my home to be this organised. I've been clearing stuff out and reorganising for months but as soon as I get rid of stuff more stuff seems to creep in. I don't know where I'm going wrong! Everyone seems to forget Martha never does anything on her own. She has many hands helping her! Everytime I try to do something like that I find there are ALWAYS things that don´t exactly go anywhere or they don´t have the right size (this is very usual).The images are perfect and therefore belong to a perfect world , not really mine. Organization is the best! Makes me feel like a new woman! That 2nd pic with all the green containers is my new "happy spot" - when the kids are driving me nuts and I need to go to my happy spot, it's that drawer. I've been feeling the same way lately. My workshop is a mess and everytime I straighten it up, it gets messy again. LOL! I've started on the closets. I really like to keep things organized. For some reason I can think clearer when things are in their place. Love all the photos. If these don't inspire, then nothing else will!! I just viewed those photos yesterday! Loved them all. 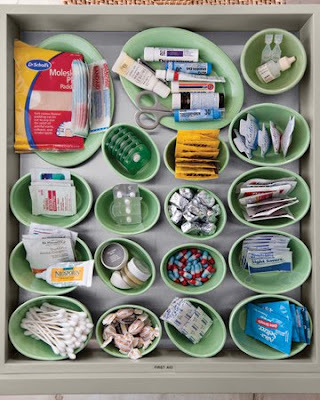 I especially liked the "first aid" drawer. I can't tell you how many times we had to run upstairs for the occassional advil or bandaid...this is much more convenient! I also enjoyed Martha's article, but was very upset with the picture (the second one you posted) that has open pills in a little bin. A huge no no, and I hope your readers get that too. It is not safe, even if you don't have children around, there is no label, so you don't know what it is and if you do now, could easily forget over time. Also, they don't last as long. They are kept safe and last to their expiration date in their bottle, but out of the bottle are exposed to oxygen and other elements that cause them to expire sooner. Just something I feel is important. It may look prettier, but it is not safe. Love your blog. I dream of being this organized! I dream of being Martha as well! LOVE all of the pictures you shared with us! 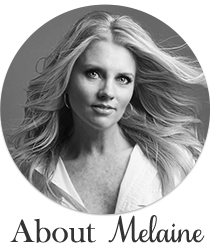 Yes, great post, Melaine! 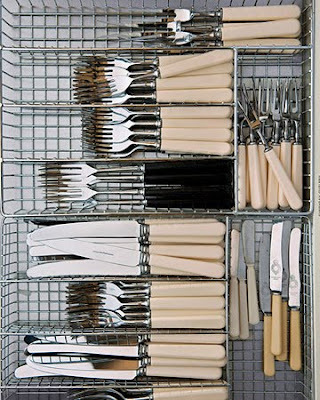 I have also been craving organization. We are almost done with our kitchen and living room remodel and the house has been turned upside down for many months. It is a good time to sort through, clean out and organize! Those photos are just the inspiration I need! Life is just so much less complicated and stressful when you are organized! your making me drool! just got back from simply organized and was wanting to buy everything there! i get very excited to organize things!! Oh I do wish to be completely ORGANIZED! 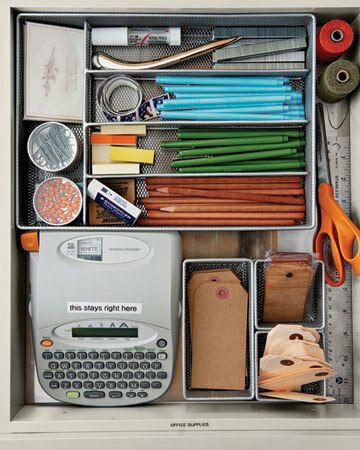 Can a creative and enthusiastic person ever really be totally organized? These pics are SO inspiring! I'm rooting for you! i feel the same way, my life turned into chaos in the summer and now needs to be put back together! Martha is my idol. I've met her, talked to her about my cute Snow Angel girlyfriends and been to a taping of her show. I idolize the woman. But do you think my house looks like hers? LOVE THOSE PICTURES!!! AMAZING! I am working on your wreath, should have it done middle of November...Hope that works for you. Good luck with the organization....I love when everything is in its place! So funny, I spent all weekend cleaning and organizing. I still have a lot to do... Oh, I did figure out that a wooden utensil holder is perfect for makeup pencils, brushes, and other little items. I spray painted it to match my bathroom and plan to line it with pretty paper to but it up a bit. Good luck with your projects. Love your blog. I think not anyone's home(especially homes that house children)are that picturesquely organized unless it's being photographed for a magazine or blog. While I am notorious for having to frequently declutter I often have to remind myself that some clutter i.e. 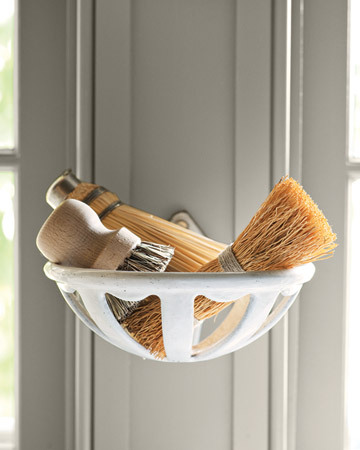 a pretty wicker basket overflowing with toiletries, a pile of the kids school work/drawings on the coffee table or even just having a junk drawer)is ok. It's an indication that life, in every emotion, resides within. I totally get this. I'm in the middle of doing the same thing to my house - one room at a time. Between projects and redecorating and just life, I find my house is always in a state that would probably have Martha clicking her toungue and shaking her head! I checked this book out of the library, in attempts to bring out my inner Martha and found it super helpful! It's her Good Things book but all on organizing. 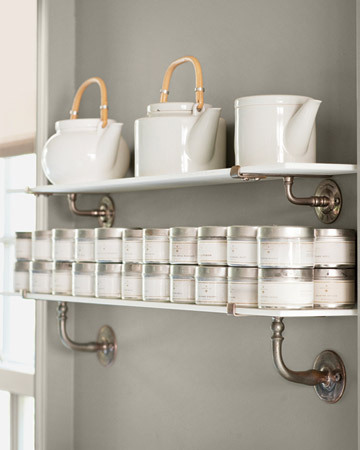 Oh - and I loved this colour in her kitchen so much, I used it in my dining room! Since I'm partial to Jadite, the drawer with the green containers is my favorite. Great ideas, very inspiring to open drawers and de-stash and organize! I wonder if it is the change of seasons? I've been feeling the same way also. Even woke my tired bones up two hours early this morning to try and make a dent in my laundry room. I need Martha to come organize my stuff too. Like you, I've been anxious to get everything in tip top shape for the upcoming hiberation weather. I'm not sure it will ever reflect Martha, but we can try! Hi. This article inspired me to reorganize my entire kitchen and help my daughter with her's. I also did a blog about it and added more ideas.